The Khans and the Bachchans have always been on good terms with each other and are often seen sharing candid moments together. We stumbled upon a group picture of Shah Rukh Khan, wife Gauri, daughter Suhana and her grandmother with megastar Amitabh Bachchan’s daughter Shweta Nanda and her daughter Navya Naveli having a wonderful time together. The Khans and the Bachchans have always been on good terms with each other and are often seen sharing candid moments together. And it is quite evident from their recent gathering. We stumbled upon a group picture of Shah Rukh Khan, wife Gauri, daughter Suhana and her grandmother with megastar Amitabh Bachchan’s daughter Shweta Nanda and her daughter Navya Naveli having a wonderful time together. Recently, the two big parivaar’s were also seen sharing an emotional and proud moment together during their kids’ graduation ceremony. 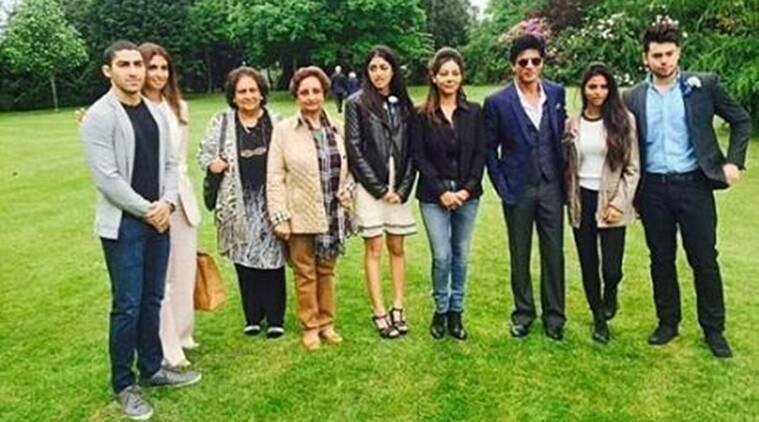 Shah Rukh Khan’s elder son Aryan and Amitabh Bachchan’s granddaughter Navya, who were studying in the same school, completed their graduation from the Sevenoaks school in London. While the doting father Shah Rukh Khan along with his wife Gauri and daughter Suhana joined Aryan at his school to celebrate his big day, Navya Nanda, who is good friends with Aryan, was accompanied by her mother Shweta Bachchan during the convocation ceremony. Later, the two families were also seen partying with filmmaker Karan Johar, who hosted a celebration on the occasion of his 44th birthday on May 26 in London.